My stomach is growling just looking at the picture of this fantastical sandwich. I originally spied it in an issue of Cook’s Country and didn’t get around to making it until I saw Norah post about it on her blog. After she raved about it, I knew I should try it and it did not disappoint. These babies are fast (so fast!) and hands-down better than any sandwich I’ve paid mega-bucks for. Because the steak is cooked in a stovetop skillet, you don’t have to worry about the cold weather (assuming you have cold weather in your area) deterring you from grilling up these sandwiches. 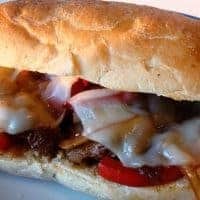 I fashioned one of my favorite roll recipes into hoagie buns and the combination of the succulent steak, tender veggies and creamy provolone cheese on light and perfect homemade buns was breathtakingly wonderful (not to mention quite economical). Adjust oven rack to upper middle position and heat oven to 450 degrees. Pat steak dry with paper towels and rub saute spice liberally into each side. Heat 1 tablespoon oil in large skillet over medium high heat until rippling. Cook steaks until well browned, 5 to 6 minutes per side (this is all the cooking time the steaks get so cook them according to your preference). Transfer to plate and tent with foil. Let them rest for five minutes, then slice thinly against the grain. Meanwhile, add remaining oil, onion, bell pepper, mushrooms, and 1/2 teaspoon salt to empty skillet and cook until vegetables are softened and golden brown, 6 to 8 minutes. Off the heat, stir in steak sauce, oregano, and sliced steak until well combined. 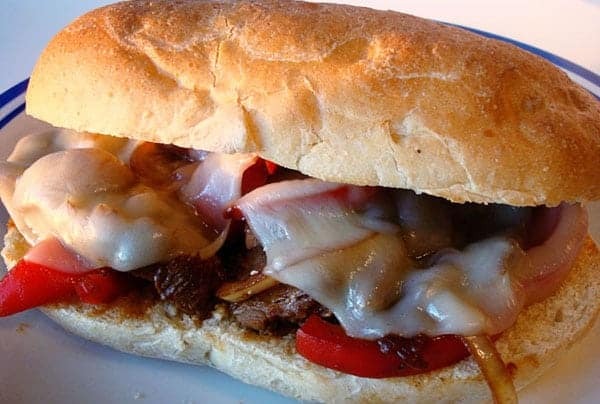 Divide steak mixture among rolls and top with cheese. Arrange sandwiches on rimmed baking sheets and bake until cheese is melted and rolls are golden brown around edges, about 5 minutes. Serve. Hi Mel! I made this recipe this evening – loved it!! Thank you so much for your blog, it has got me cooking things I never thought I could :). Just made these tonight and we are hooked. Thanks for the amazing recipe. I’m honored to be featured on your blog! Now you’ve got me hungry enough I want to try that sandwich again. Yum-ee! I’m sure I could tailor this recipe to make on my Foreman Grill. These look amazing and definitely on my to cook list…. I am sure they will be a hit at my place. OMG! Those hoagies look amazing! Perfect football food!! Isn’t that a drool-worthy sandwich? All that cheese oozing out. Guess I’m going to make this one soon. My stomach is growling from the picture too! Looks so good. i don’t think ANYTHING could deter me from making these! it’s actually pretty rare that a savory something ignites my drool factory, but this sammich has done just that! I was so inspired by this sandwich that I wanted to let you know I’ve got a “One Lovely Blog” award for you on my blog. Pick it up at http://tonyadusold.blogspot.com/2009/10/one-lovely-blog.html. I chose you because you inspire me to express myself creatively. Here’s the rules for the “One Lovely Blog Award.” Accept the award, post it on your blog together with the name of the person who has granted the award, and his or her blog link. Pass the award to 15 other blogs that you’ve newly discovered. Remember to contact the bloggers to let them know they have been chosen for this award. The sandwich reigns king at our house and this is definitely going to have to join the royal court! Thanks. Ok, this is on my list for this weekend. my boys will love me *forever*. Yum! This is going in my to-make list!